Reviewing the latest disc of music by British composer Judith Bingham on Naxos (8.572687), I find myself comparing her musical style with that of others. There's a terse little mini-concerto for organ and strings which in places reminds me of Copland while Alain, Langlais and Messiaen spring into my mind when I hear some of her organ solo pieces. I dislike this habit of drawing comparisons between different composers rather than recognising their individuality, and I am exercised in expunging some of these references from my review before I submit it to Gramophone. But I am in two minds. Despite the obvious problems of drawing loose connections, which probably are not even there and which might even hint at a lack of originality, is there not some value in introducing the unfamiliar by emphasising its similarities with something familiar? This has been a good month for Judith Bingham; helping, no doubt, to sugar the pill of next year's 60th birthday (don't worry, Judith, I'm only two years behind you, and so I know we're both still young!). She had a BBC Proms première last Sunday week and now the release of this, the second disc from Naxos devoted to her music. She's certainly not an unfamiliar name to record collectors or concert-goers, but to date it is mostly through her choral music that she has become known; both this month's Proms piece and this Naxos disc are of her organ music. Those who enjoy and collect organ music live largely in a state of denial about the rest of the musical world (and, of course, vice versa), so even though the larger musical world will know of Bingham, for organ buffs the name means nothing - well, not quite nothing, mention Bingham to organists and they will immediately assume you are referring to the American organist/composer Seth Bingham (1882-1972) familiar through his pastiche suite, Baroques. I recall telling a very well-known organist that I was undertaking research into the music of Frank Martin and being appalled when he, in all genuineness, asked whether there was enough to warrant a graduate thesis; "I know about the Passacaille. Good piece. Has he written anything else?" I never dared asked whether he'd ever heard of Schoenberg, Berg or Webern (useless composers – not a note of organ music between them! ); while his own gods – Dupré, Vierne and Rheinberger – remain complete nonentities to anyone outside the organ world (or at least they did then – adventurous record companies have begun to show that all three had profitable lives outside the organ loft). Into this environment I cannot just introduce the name of Judith Bingham and expect everyone to know about her background and style. So it helps to be able to introduce her music by describing it in terms those most likely to buy this disc will understand. The easy thing is to draw parallels with which they are familiar, but this is probably as pointless as describing every meat which is not beef, pork or lamb as "tasting like chicken". (The first time I ate crocodile – ironically in the company of the late Steve Irwin at his Australia Zoo in Queensland – I was asked to describe its taste. "Most people say it tastes like chicken", I was told; "No", I honestly responded, "it tastes like crocodile".) The fact is, though, it is very difficult to hear any organ music written in the last 100 years without finding parallels with the French masters – Messiaen, Dupré, Alain – simply because these French composers were so influential in writing for the organ that their models are just about impossible to ignore. 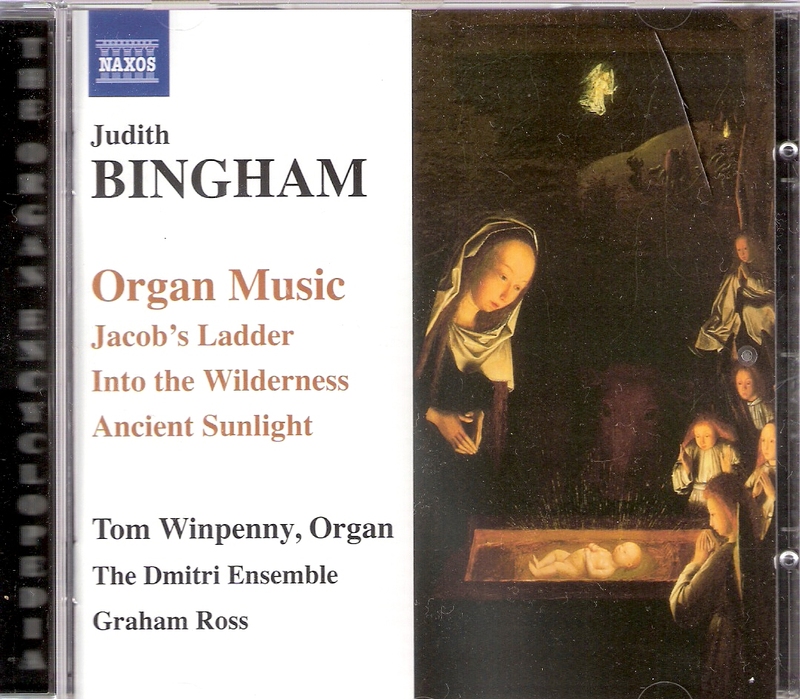 So is there any value in suggesting that aspects of Judith Bingham's writing for the organ are reminiscent of them? 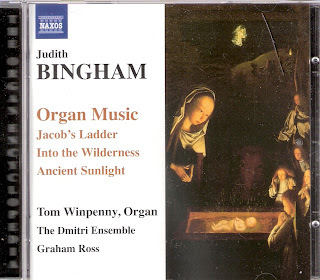 Judith Bingham's writing for the organ is certainly original; you could never listen to it and confuse it with someone else's. But it is not particularly distinctive; unlike, say, Mathias (with his dancing rhythmic rows of bare fifths) and Leighton (with his insistent chromatic steps full of seventh and second harmonies), she does not write in a style which has an immediately identifiable individuality about it. You would hear it and know who it was NOT, but you would not be able to say who it WAS. So, to that end, I feel it is incumbent on me to describe her musical language to the uninitiated. Just because it's organ music should not be excuse enough for buying the disc - although some will – nor should the fact that it reveals the latest re-fashioning of the Harrison and Harrison organ in St Alban's Abbey. Perhaps some might buy it simply to hear how good Tom Winpenny, a fairly new entrant on the British organ scene, is. My review will, of course, address these elements – but you will have to read my thoughts in the pages of Gramophone's Awards issue in October – but my main focus is to describe to potential purchasers what they might expect musically. Without drawing on other comparisons, I suppose I would describe her organ writing as sympathetic rather than idiomatic, a little too reliant on registration effects rather than sustained musical arguments (she herself confesses to having demanded registration changes in every bar in her earliest writing for the instrument) and aiming for a "churchy" sound rather than strong, self-contained structures – there is something almost improvisatory here, not least in the Prelude and Voluntary. She's not a great melodist, but as one who is both a singer and a very experienced writer for the voice, melodies are ever-present and are held within fairly limited compasses; perhaps reflecting her own singing experience as a choral alto. The harmonic language is pungent rather than acerbic, chords terse rather than tense and textures never thin but neither overbearingly fulsome; except for the closing chord of Voluntary which sounds to be an exact crib of the final chord of Alain's Litanies. She is not really comfortable in handling slow music on the organ – what works well for the voice and other instruments doesn't work in the unforgiving uniformity of the organ's sustained tones – and pauses and moments of repose can seem painfully pointless (as with the aimless opening of Annunciation I). Above all her music strives to tell a story – in most cases here, one drawn from The Bible and Christian writings – so it pursues a logical and coherent path with a definite sense of direction. Unfortunately Gramophone stipulates pretty harsh word limits effectively preventing such a detailed description of her style. How much easier it is to say "this bit reminds me of Copland, this bit reminds me of Langlais, and this bit suggests Alain". But does that really help create an impression of what is a unique musical voice? 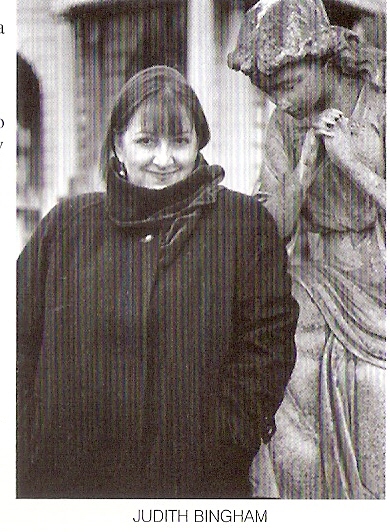 I am Patricia Bingham Dale, granddaughter of composer Seth Bingham. I was interested to read that Judith Bingham is interested in geneaology. Maybe you could let her know that I can be reached at pattdale@bellatlantic.net. As you probably know, my grandfather composed over 25 works for organ, numerous choral works, and has had his music played by major orchestras. "Unto The Hills" and "Memories of France," played by Christopher Marks and available on Raven CD's.